This article originally appeared on The Brain Dialogue. Suzanne Shubart. Now brain travellers can track their explorations with highly-detailed maps created with state-of-the-art imaging technology. You’re lost in the desert and, after wandering for days, in the distance you spot a giant red rock jutting out of the barren landscape. Had you never encountered this landmark before (and your iPhone hadn’t run out of battery), Google Maps could help you identify it as Australia’s most famous natural wonder. Share your location with friends, and the coordinates will tell them where you can be found … exactly. And so th e new MRI/DTI Atlas of the Rat Brain offers guidance to brain researchers. “MRI gives you the structure…high resolution and good contrast to see where things are. DTI (diffusion tensor imaging) shows the direction in which the water travels. It gives you the direction of the fibres,” says CIBF chief investigator Prof George Paxinos of Neuroscience Research Australia and the University of New South Wales in Sydney. Paxinos created the atlas with CIBF associate investigator Prof Charles Watson, also of Neuroscience Research Australia, and researchers at the Centre for In Vivo Microscopy at Duke University Medical Centre in Durham, North Carolina, with support from the National Health and Medical Research Council and CIBF. The MRI/DTI Atlas of the Rat Brain is a collection of high-contrast maps to navigate the brain, 250 microns at a time – equivalent to the diameter of a grain of fine sand. Its resolution is nearly 400 times what any other lab has achieved with MRI and DTI. By checking what might be expected at given coordinates, researchers can identify the anatomical structures. Or, when studying rat models for human diseases like Parkinson’s, epilepsy, autism or Alzheimer’s, they can compare the diseased brain with the healthy brain depicted in the atlas. They can use the coordinate system as a frame of reference for relaying information to others. The biggest advantage of MRI/DTI imaging over the histologic procedures used for Paxinos’ previous atlases is that there is no cutting with a knife. This eliminates tissue distortion and makes for a more accurate coordinate system. 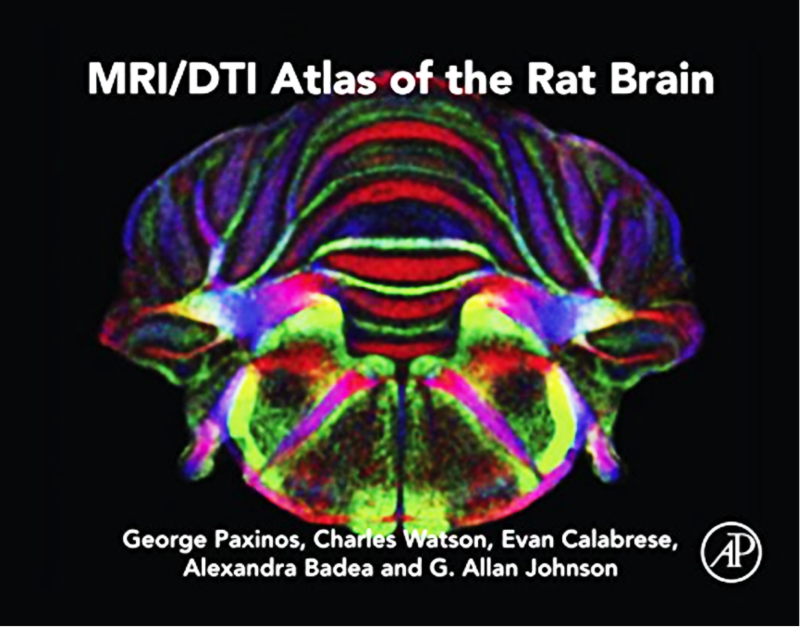 MRI/DTI Atlas of the Rat Brain is available in hardcover or e-book. An online 3D version of the atlas is in the pipeline, which will allow researchers to overlay data onto the maps, creating a central repository of findings. Despite that, Paxinos did eventually map the human brain. And the monkey, the mouse and even the bird brain. But now, after decades of exploration, he has returned to his first love (yes, the rat) to produce this new-generation brain atlas. Next steps: Paxinos hopes MRI/DTI Atlas of the Rat Brain will inspire others to do something even better.